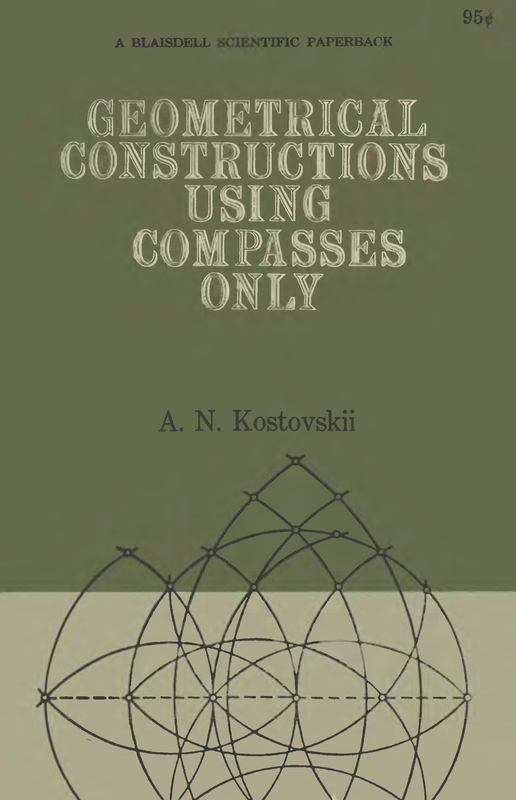 We now come to another title in the Little Mathematics Library series, Geometrical Constructions Using Compasses Only by A. N. Kostovskii. organized every year since 1947, for the pupils of secondary schools in the city of Lvov. These lectures served as a foundation for the writing of the first part of this work. out with a limited opening of the ‘legs’. The present article is written for a wide circle of readers. It should help teachers and pupils of senior classes of secondary schools to acquaint themselves in greater detail with geometrical constructions carried out with the help of compasses alone. This work can serve as a teaching aid in the work of school mathematical clubs. It can also be used by students studying elementary mathematics in physics and mathematics departments of teachers’ training colleges and universities. The book was translated from the Russian by Janna Suslovich and was first published by Mir Publishers in 1986 (77 pp). This book was also part of the Popular Lectures in Mathematics Series (Vol. 4), which was published by Blaisdell in 1961. This edition was translated from the Russian by Halina Moss and was edited by I. N. Sneddon. The link below is for the PLM (1961) edition, we still need to get LML version. This entry was posted in books, little mathematics library, mathematics, mir books, mir publishers, soviet and tagged comapasses, geometrical constructions, inversion, olympiads, popular lectures in mathematics, restricted legs. Bookmark the permalink.